My sermon from the 11th Sunday after Pentecost (August 5, 2018) on Ephesians 4:1-16. Listen to the recording at the bottom of the page or read my manuscript below. So if you are a fan of the Internet, your social media feeds might have been devoted to goats over the last few days. A goat on the internet can mean many different things. It can be an acronym, referring to someone who is a g o a t – the greatest of all time. But it can also refer to that hairy little animal with horns that eats practically everything. On Friday morning, a breaking news report shook Boise, Idaho because over 100 goats were wandering in a residential area. At first, no one knew how they got there. They just showed up, wandering from yard to yard. Now, if your yard is mostly crabgrass like mine is, a bunch of goats coming over to have lunch isn’t really that scary. But if you have a yard you actually care for, a herd of goats showing up at your front door is downright terrifying. Those goats were on a mission and they were going to eat every plant in sight. Now, if you followed the story, you know how the goats got there and what happened next. Everything, eventually, worked out and the goats went back to where they came from. It’s a fun little news story with a happy ending but instead of focusing on how the story ended, I want to spend time with how the story began. And it started with a tweet. Joe Parris, a reporter for a tv station in Boise, received a tip about these goats, so he went out and found them, taking 4 pictures of the goats with his phone. 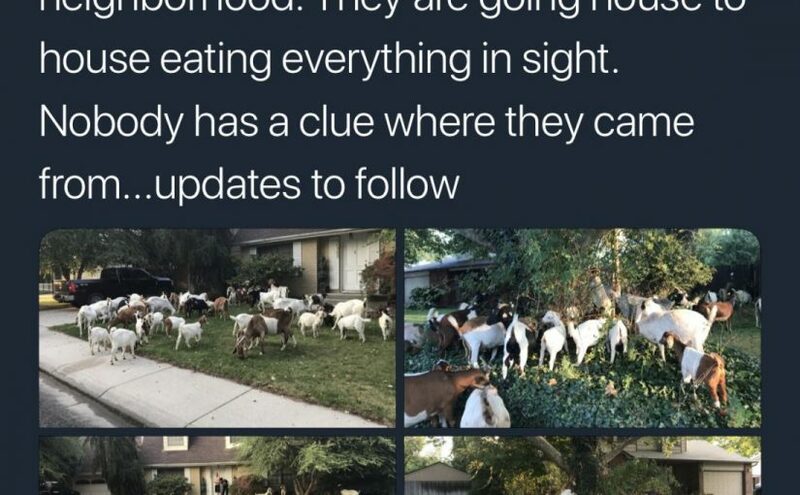 He immediately sent word to the wider internet that by writing this: “#Breaking – About 100 goats are on the loose right now in a Boise neighborhood. They are going house to house eating everything in sight. Nobody has a clue where they came from…updates to follow.” Goats on the loose is a really great sentence we don’t hear often. And this short news tweet had everything in it to keep us interested. But what drew me into this story wasn’t only the goats. Rather, what enticed me was how no one knew how they got there. It was a mystery! And the very best kind of mystery there is. If imagine ourselves as one of the homeowners on that street, seeing one goat in our front yard would be unexpected. But seeing over 100 goats would totally blow our mind. We would wonder where they came from but that question would have to wait because the mysterious herd of goats would be making our flower and vegetable beds disappear in a very non-mysterious way. We wouldn’t get to dwell on where this mystery came from. Instead, we have to live with it, and engage it, right away. And that’s what makes mysteries powerful. A mystery is an experience we can’t, in that moment, fully explain but it is something we have to live through. We run into these kinds of mysteries all the time and they’re usually very small. We might get a phone call late at night from an unlisted number and wonder who called us. But when that person leaves a voicemail, that little mystery is solved. Yet there are other mysteries that we are asked to hold onto; mysteries we can’t fully explain. And that’s important because it’s those mysteries that teach us who God is calling us to be.